BUILD is wrapping up a project that introduces translucency and light in some new ways; today’s post includes several finished photos of the assembly and covers some of the design and construction technicalities. 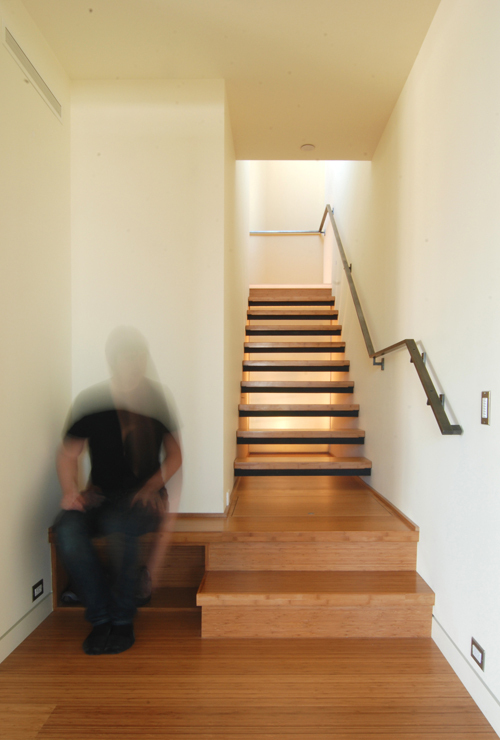 The open-tread stairway of this Seattle penthouse build-out is positioned in front and on top of the master-bath shower. A sheet of ¾” thick “Varia Modern Drift Green” manufactured by 3-Form separates the shower and the stair; light from the shower creates a glowing affect and illuminates the stairway. 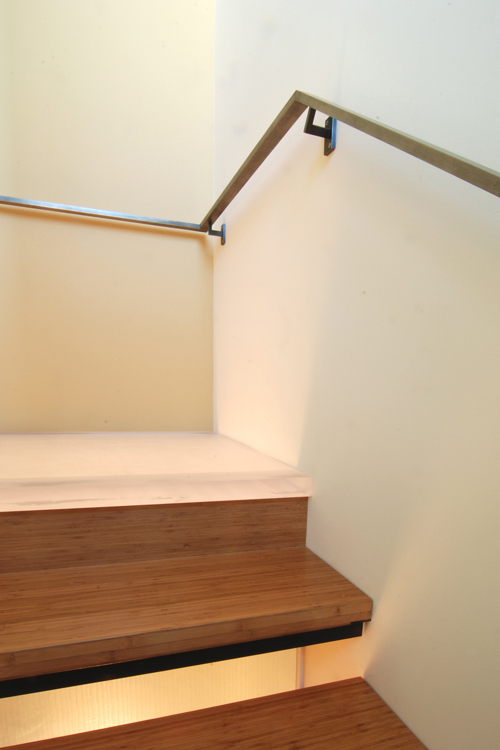 The landing is made of 2” thick acrylic, sanded on all edges for a diffused light effect at the stairway and the shower below. Three of the nine treads are outfitted with 24” long LB24X-WARP side-exit LED strip lights manufactured by LED Power. This allows the shower inside to be artificially lit from the glow of the vertical panel. Because the landing also lets in natural light from the atrium above – it’s possible to shower without having to turn on any electricity. The landing is held in place with galvanized steel angles concealed vertically behind the shower wall tile and exposed horizontally. 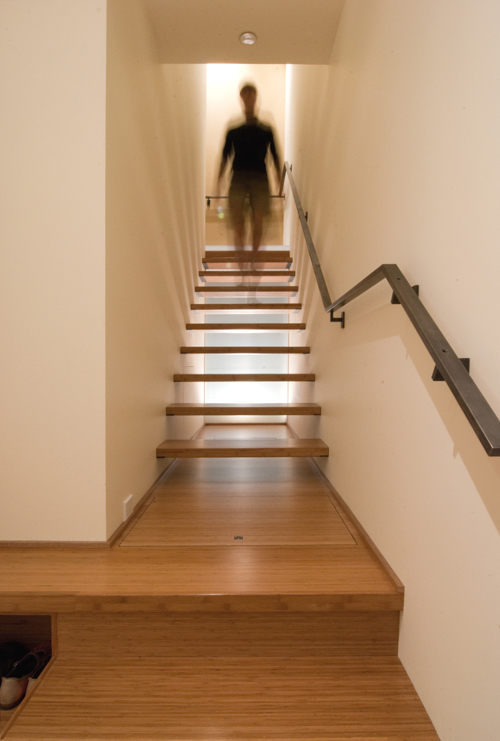 A concealed door on the left side of the stairway allows access to the area under the stairs. The bamboo treads are prefabricated and manufactured by Teregren. The general contractor on the project is Charter Construction. The lighting designer is Precision LD. 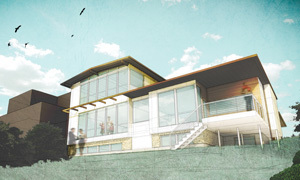 The architect is Andrew van Leeuwen of BUILD LLC. 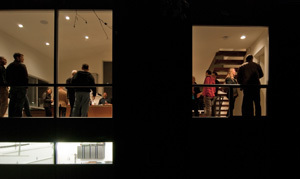 The homeowners, who wish to remain anonymous, were instrumental in the design; their clever thinking and creative ideas were indispensable on this project. Nice project. 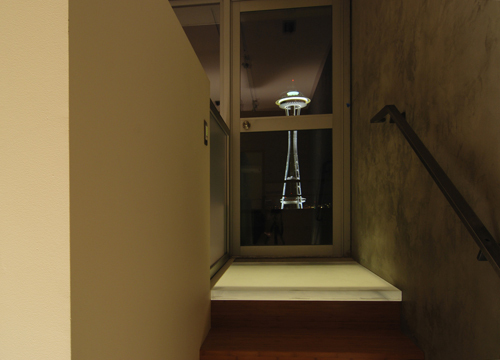 My only question is – you couldn’t get a door without something obstructing the view of the Space Needle? Seems like a lost “a-ha” moment for visitors. @Matt – The envelope of the building (including doors and windows) was existing. 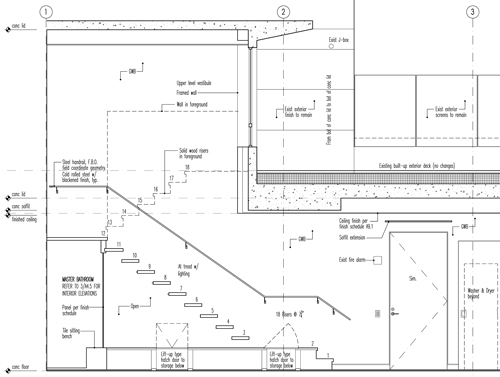 Modifying the envelope of a downtown condo is a big deal (liability wise) and we chose to stick with what was there. Oh, I remember that! It looks good now that it’s done! 🙂 Good job! 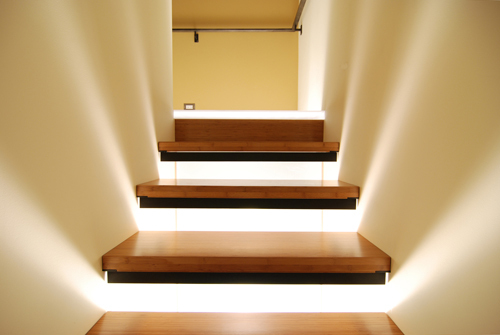 Great looking stair. 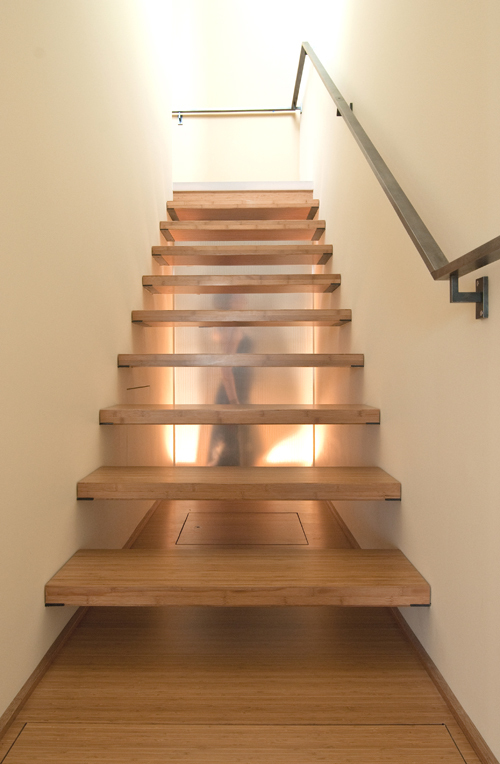 I really love the translucent box effect of the shower and clean detailing of the stair. Did you run into code issues with the open riser like that? 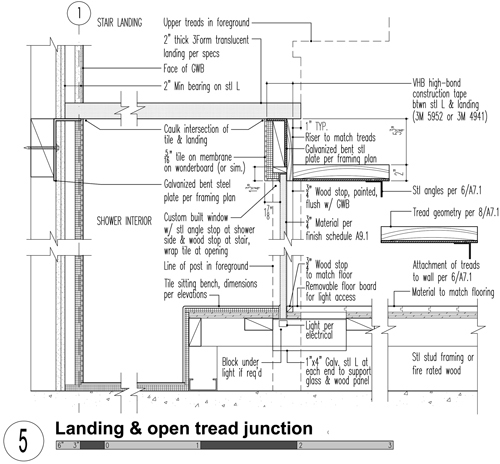 @ Jared – You’ll notice that in some of the photos there is a steel angle attached to the bottom of the treads – this keeps the opening height at the risers to less than 4″ (in accordance with the International Building Code). Some of the photos were taken before the steel angles were installed. did you let the treads into the sheetrock or is it simply a tight measurement? Do you hire an architectural photographer? Or, if you do it in-house, did the photographer have some formal training or simply learn on the job? These pictures look very well-composed and professional. Thanks Vincent, we took these photos ourselves. We did quite a bit of photography work in college and continue to sharpen up our skills with the architectural shots. It’s very rewarding for us to take photos of our finished projects, it also saves a fortune. 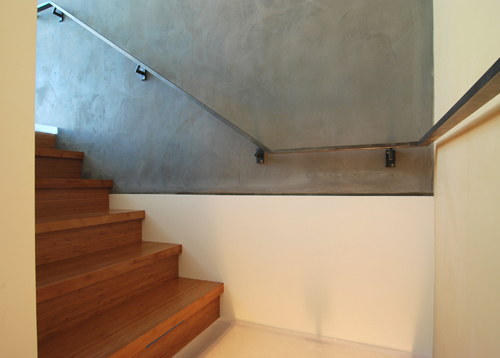 @ Arent – We designed in steel brackets mounted behind the drywall, they stick about 2″ to support the treads. The treads are then held 1/8″ off the walls. @ Mike – Custom fabricated from a local steel shop.